This is the second installment of the Beers of Texas series I am working on. Texas produces some of the most unique beers in the country. We start off this addition with Independence Brewing Company which is all about Austin. The world is quickly figuring out how pleasantly different Austin, Texas is. The city motto is “keep it Weird” after all. The ever‑growing capital city is liberal, weird, and yet still as Texas as it comes. Independence Brewing Company started their operation in 2004 and has exuded pure Austin culture ever since, thanks to beer enthusiasts and University of Texas grads Rob and Amy Cartwright. As their name suggests, there is nothing corporate about Independence Brewing, which is evident in everything they do. Independence Brewing is about that laid back Austin culture. They wear jeans—not ties. Walking in to the brewery, you can’t tell who is in charge. They operate under a certain ethic, where marketing guys help with the bottling and the boss is more than happy to grab a broom. It’s a friendly Texas team environment, keeping everyone is just happy and excited to go to work there. The first Saturday of every month is tour and tasting day at Independence. This is an incredible way to enjoy your Saturday afternoon, listen to local bands, get a bite to eat, bring your dog, and enjoy the Austin weather. Beer and Labels of Home. Independence is very personal with their beer labels. You’ll notice the cartoonish depictions of real Austin life wrapped cleanly on the side of your bottle. 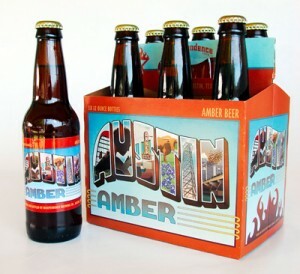 Austin Amber is Independence’s signature brew, it captures the entire city like nothing else does. Its not‑too‑heavy balance of citrus and sweetness is a microcosm of friendly Texas folks. The entire city of Austin is accurately depicted on its label, from lakes to bats to local movies to longhorns to bluebonnets. There couldn’t be a finer Beer of Austin. 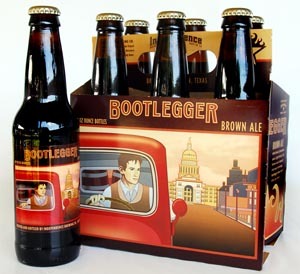 Bootlegger Brown is chocolaty and rich enough in taste to go without a label; however, the sharp‑dressed man staring at the Austin skyline in the mirror of his old red pick‑up as he makes a run for it…brings you back to a different time—when brewing and distributing beer in Texas was a dangerous passion. Just let me know, Ill see what I can do.